Smallfoot is a new animated adventure that is set to hit our screens on October the 12th. 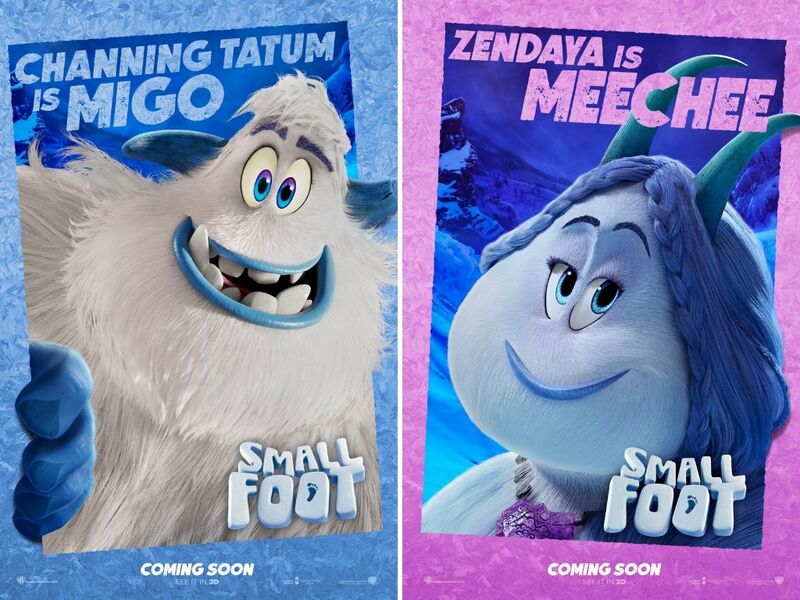 With original music and an all-star cast, Smallfoot, turns the Bigfoot legend upside down when a bright young Yeti finds something he thought didn’t exist—a human. News of this “smallfoot” throws the simple yeti community into an uproar over what else might be out there in the big world beyond their snowy village, in an all new story about friendship, courage and the joy of discovery. 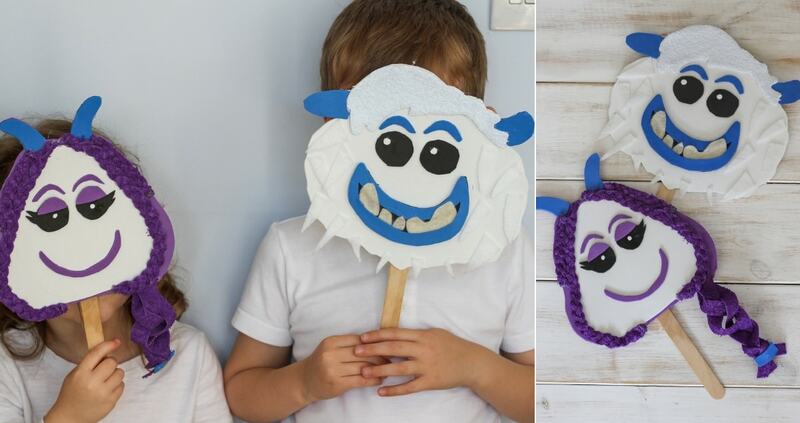 Warner Brothers invited us to create a unique Smallfoot themed craft in celebration of the film hitting cinemas next week. 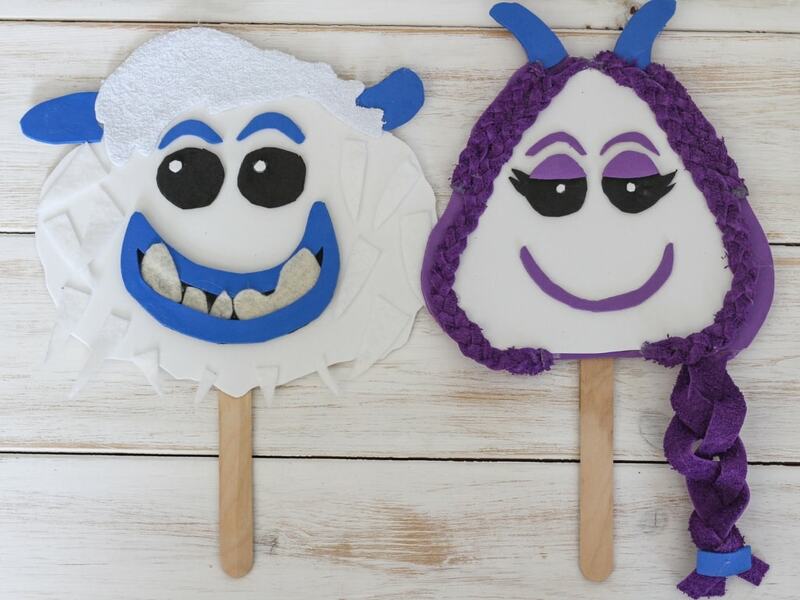 We have created these really easy masks, featuring two of the main characters, Migo and Meechee. 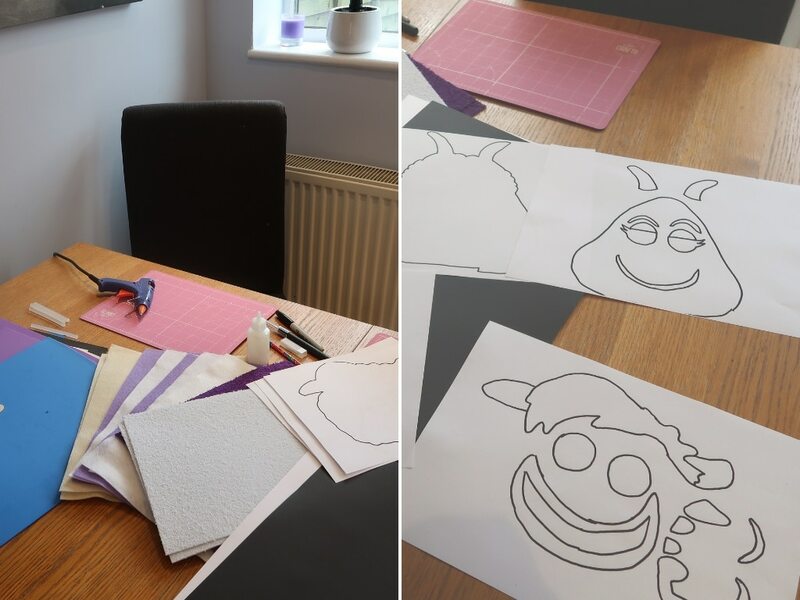 We have created free mask templates which you can download to make your own masks. You can choose to either watch our video tutorial below, or follow the step-by-step instructions further down. Blue, white, black and purple card or craft foam. The first step is to cut out all of the parts on our template in paper or card. You can do this with scissors but a craft knife does make in easier. Next draw around the templates in the right colour foam or card. 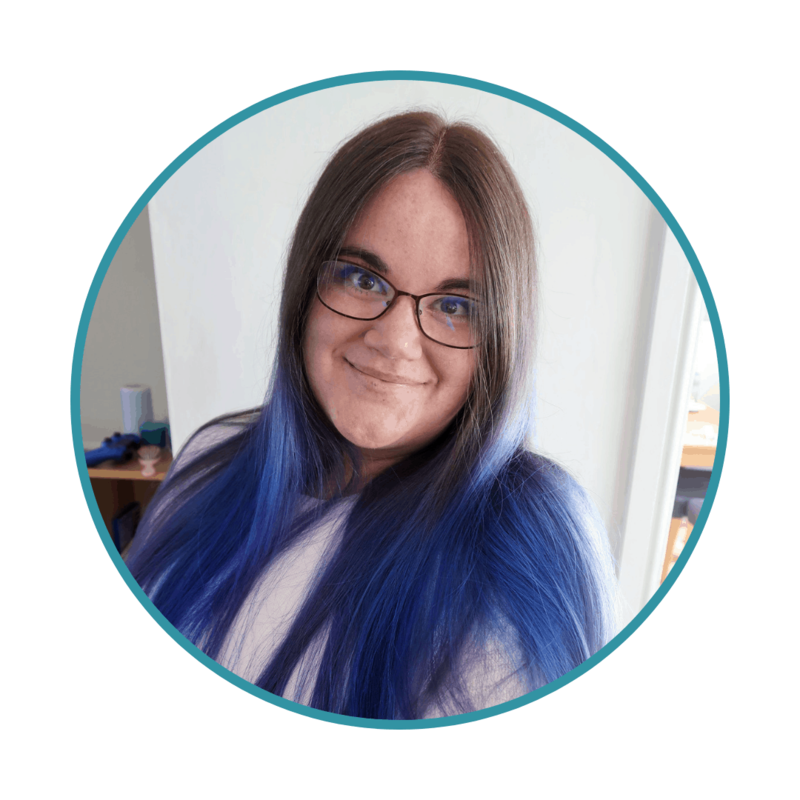 You can see on the pictures that the faces are white and the features and details are blue for Migo and purple for Meechee. Make sure that you turn the templates over when you draw around them, so that pencil or pen marks are on the unseen side in the final mask. Once you have cut out all the different parts, in is easy to assemble and glue them. Layer the parts top to bottom. For example, the parts for Migo’s mouth should be a black mouth, teeth, and blue lips. Glue the teeth down onto the black mouth first and then put the lips over the top. For Meechee’s braids, you could just use flat card or foam and draw them on. However, we chose to plait some material for ours. You could use felt or foam. We used textured purple foam. Cut three strips of your chosen material to create each plait. We used very small strips for the smaller braids on the head and larger strips for the main plait. Once you have assembled both of the faces, all that remains is to make them into masks. We added lolly stick handles. However, you could add small holes, or string or elastic, in order to make the masks wearable. Don’t forget to cut some small eye holes if you choose to do it this way! And there you have it. Your characters are ready for play, dress up, or a film screening. We hoped you enjoyed our craft and are looking forward to seeing the film! Please note, this post is a paid collaboration with Warner Brothers. For more information, see our Disclosure Policy. These look wonderful! And they really look like the characters from Smallfoot. I love doing crafts with my boys and this is something that they would really enjoy making. My kids love making masks. Great tutorial! These look super cute and so like the real deal as well. Bet the kids lives doing them as well! I really love these, they look fab! I love this. With the great tutorial, me and my kids will definitely love this mask.